You can really do a lot with baked acorn squash. This is a fabulous recipe that pairs the squash with a savory rice, onion, cranberry and nut filling. It makes a perfect vegetarian main course recipe. Just add a salad and you have a wonderfully tasty and nutritious dinner recipe. For the meat eaters of us, this acorn squash recipe is perfect as a side dish with just about any meat. It would work well with beef, pork or chicken. Bring water and rice to boil in large heavy saucepan. Reduce the heat, cover and simmer until the rice is tender, about 20 minutes. Drain the rice and transfer it to a large bowl. Meanwhile, place the squash, cut side down, on a greased baking sheet. Bake in the preheated oven until tender, about 40 minutes. Cool. Using spoon, scoop out pulp from the squash, leaving 1/4 inch around the shell. Place the shells to the side. Transfer the pulp to a medium bowl and chop it up into small pieces. Melt the butter in large non-stick skillet over medium heat. Add the onions and sauté until very tender, about 15 minutes. Add the sage and stir for 2 minutes. Add the rice, squash cubes and lemon juice. Stir together to mix. Mix in cranberries, hazelnuts and parsley. Season with salt and pepper. Divide the rice mixture evenly into the squash shells. Place them in a roasting pan and bake until the filling is heated through, about 25 minutes. Replace the hazelnuts with toasted almonds if you prefer or have them on hand. The hazelnuts do give the mixture a different flavor, but almonds are nice in this mixture too. 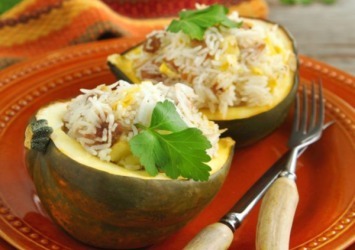 Replace the white rice with wild rice for a more gourmet stuffed acorn squash recipe. The wild rice needs to be cooked for about an hour, or just follow the instructions on the package. Also try dried blueberries instead of the cranberries. I like the tartness of the cranberries though. As I said, this stuffed squash is a great entree for a vegetarian meal or a wonderful and filling side dish to a meat based meal. If you are using it as a main course vegetarian recipe, you might want to serve two halves of squash per person if your squash is fairly small. Make this recipe even healthier by replacing the white rice with an equal amount of brown rice. The bran that is left on the outside of the rice gives it a much higher nutrient count than white rice and it’s also higher in fiber. Brown rice is a much better choice than white rice whenever you can use it. The brown rice does take longer to cook. Read the instructions on your package, but it usually takes about 40 minutes to cook. It has a firmer texture than white rice and a nuttier flavor. I think it would work perfectly in this recipe. OR, replace the rice with quinoa. Quinoa is high in protein and other nutrients and is really delicious. It would work well with the other ingredients. Squash is so nutritious and so economical in the fall and winter. It’s a great cool weather vegetable and you can use it in great recipes like this one that turn a low cost plain vegetable into a gourmet delight. The calorie count for this recipe may seem high, but remember you have your starch (rice) and the main vegetable all in one recipe. For a full meal, all you need is the meat. Browse our vegetable recipes for more great recipes like this baked acorn squash.